Generally there is a communal atmosphere when training at TianMeng Academy and guests are expected to follow rules as the school life is set by timed practices and routine. It is different from staying in a hotel, and combined with the training given, is a very authentic experience. Tianmeng teaches many styles of Kung Fu such as Shaolin, Wing Chun, Qi Gong, Tai Chi, Meihua Quan, Bagua, Xingyi, and Baji. They are famous for their unique training in Meihua poles, which was previously a Chinese Kung Fu secret. Tianmeng also offers optional classes such as Mandarin, Chinese traditional medicine, Chinese culture, calligraphy, tea ceremony, as well as Buddhism and Taoism theory. When you arrive at the academy, you will be assigned a master according to what you want to learn. Your master will assess your abilities and create an individual training plan to suit your level, wants, and needs. Tianmeng Academy facilities include a single room for each student. The academy respects everyone's privacy and a need for a proper rest beside the training. The bathrooms have male and female separation. Each one consists of western toilets, private shower cabins, and washing machines. There is permanently hot water for the convenience of the students. During the summer, there are free fans and air-conditioning. During winter, there are heaters as well as electric blankets. The academy has a capacity of not more than 40 students that keep the academy in a family-like atmosphere and maintains the coziness and the comfort of students. Make sure you inform Tianmeng Shaolin Kung Fu Academy in advance of your trip to the academy so they can guarantee you an available room (especially during the summer months). The dining room is open all day and it is a place where you can also relax, play pool, table tennis, basketball, and football, or use the TV and DVD player in your free time. The academy also has a classroom which could be used for quieter activities such as reading and studying. Tianmeng Academy offers two training salons for indoor use as well as outdoor training space. During the program, students must abide all the following Tianmeng Academy rules and regulations: The morning training begins at 6 a.m. The schools main door is locked at 9.30 p.m. and students are required to sleep at 10 p.m. in order to get enough rest and recover for the next day training. Students must arrive on time for training, minimally 5 minutes before the start of the training and make sure they get enough rest to maintain the focus and ability to train properly. Formal training at the academy starts at 6.00 a.m. However, students can wake up at 5.30 a.m. for warm-up running and catching fresh air along the mountain road or playground of the academy. Fridays from 5 - 6 p.m. is the maintenance of the academy, which means that everyone (students and staff) is taking care of the training salons, the bathrooms, the dining room, and the kitchen. This is part of the training and it is an accepted routine in many traditional Kung Fu schools in China. Students must keep themselves and the academy neat and clean. There will be a room inspection on Mondays at 8 a.m.
Thursday and Friday are identical to schedule 1. What is Chinese Kung Fu? Chinese Traditional Kung Fu has no written scriptures, but follows nature, with a history going back 5000 years, composed of the specific forms and unique training methods. Kung Fu is a very important part of Chinese traditional culture. It is based on Yin and Yang, Five Elements Theory (lungs pertain to metal, kidneys pertain to water, the liver pertains to wood, the heart pertains to fire, and the spleen pertains to earth), and the Book of Change (I Ching). Kung Fu also absorbs the essences from Confucianism, Taoism, and Buddhism, getting meridians, collaterals, and meridian points theory from Chinese traditional medicine. What can you get from Chinese traditional Kung Fu in Tianmeng Academy? Chinese traditional Kung Fu is a magical box. From this box, you can get what you want, including a healthy body, good sleep, longevity, graceful body shape (not fat or thin), optimistic mood, broad mind, strength, speed, flexibility, coordination, responsiveness, integrity, magical fighting and combat abilities, strong self-defense, a strong will, extraordinary courage, the ability to adapt to different environments, independence, and the ability to cooperate with others. Inspiring thinking, wisdom, strong learning ability, and high working efficiency learned in traditional Kung Fu training can make you succeed in your career more easily. You will have more time to enjoy your life, with great relationships with family and other people, and you will achieve a great sense of happiness in helping others. This six-month training will include more Chinese Kung Fu theory (to reach a complete understanding of it), more authentic traditional healthcare Qigong, hard Qigong, low and high Meihua Poles training, more flexibility training, stability training, endurance training, more forms and weapons training. 3 or 4 traditional Shaolin fist forms from Xiaohong Quan, Dahong Quan, Luohan Quan, Qixing Quan, and their applications. 42 style Tai Chi form, Tai Chi 48 style form, and applications. Advanced Sanda training and application, counter-acting exercise, and pair sparring. Siu nim tau (little idea form) and applications, Chum kiu (seeking arm form) and applications, wooden dummy training. Meihua Quan form one, Meihua form two. 3 or 4 traditional Kung Fu weapon forms from broad Sword, nine-section whip, Spear, double Daggers, double Swords and their applications. Forms/pattern: one against one without a weapon, one against one with the staff. These abilities require agility of the movement steps, strength and speed of kicks and punches, the accuracy of single moves, coordination of your body and the strength, deeper low and high Meihua Poles training, speed and spirit of Chinese Kung Fu. Tai Chi is an internal martial art which incorporates Yin and Yang, two equal elements that complement each other and the five element theory. The movements are soft, gentle, and relaxed while still managing to remain strong and steady. Tai Chi forms have many defensive applications that use soft movements to defeat hard movements. The study of Tai chi primarily involves three aspects: health, meditation, and martial arts. Tai Chi's health training concentrates on relieving the physical stress on the body and mind. It can help lower blood pressure and improve or cure many chronic illnesses. Tai Chi's meditation training concentrates on teaching you to have a clear and peaceful mind while still being aware of your surroundings this can help with reducing stress and maintaining homeostasis. Tai Chi's martial art training concentrates on internal power and redirecting the opposing force for self-defense. The applications are challenging and take a lot of time and practice to be able to use them correctly. At Tianmeng, the three most popular styles of Tai Chi; Yang, Chen, and Wu are taught. During your stay, you will begin with learning Tai Chi basics and a short Tai Chi fist form. When you have become proficient in these movements you will move onto more complex fist forms and later learn other sword and weapon forms. While you are practicing Tai Chi you should try to keep a clear mind, you are breathing naturally from your belly, and keep your movements steady and continual in a fluid motion. Remember to stay relaxed and make sure that your upper body and lower body are always working together. Sanda, Chinese kickboxing, is a fast-paced combat system which trains and develops self-defense and fighting skills. It is made up of four major areas, kicking, punching, grappling, and takedowns. It is not normally considered a style itself rather as one of the two components of Chinese martial arts training and is often taught alongside traditional Chinese styles. Originally created for the training of Chinese soldiers in hand to hand combat. Over the years, Sanda has been adapted for modern soldiers and has become the major combat sport in China. Sanda's techniques, theory, and training methods are derived from traditional martial art styles. During your stay at Tianmeng, beginners will be taught punching, kicking, drills, and fighting combinations. After you have mastered these you will be taught more advanced techniques such as takedowns and sparring. Throughout, you will be taught to have more control over your body and mind. Qi Gong translates to 'life energy'. Qi Gong is split into two parts; internal also known as soft Qi Gong and external also known as hard Qi Gong, both involve three parts, breathing, posture (moving or still), and mental focus. When external and internal Qi Gong are used together, they can assist masters to achieve unbelievable things like balancing on sharp ends of spears or breaking marble with only a finger. Internal or soft Qi Gong is practiced to improve your Qi, which is believed to make you healthier and energize your body and mind. Some of the health benefits these forms provide are improving your blood circulation, organ cleansing, bone marrow cleansing, and generally helping to prevent sickness and promote life longevity. External or hard Qi Gong is practiced to physically strengthen the body and help condition the bones, and this helps in preparing your body for fights and withstanding force. You can condition every part of your body, hands, arms, head, legs, fingertips, etc. Some exercises used to achieve this are headstands, handstands on your fingertips, slapping your skin, which can also help with circulation and being hit or kicked all over your body among many more techniques. It is also believed that this routine helps you to be more immune to sickness as through conditioning you hit many acupuncture points. Bagua Zhang is a combination of attack and defensive moves while incorporating Neigong (internal Kung Fu). It uses palms instead of fists for attack. The main characteristics are strikes, joint locking, throws, and distinctly evasive circular footwork. The evasive circular footwork in Bagua is one of its most distinctive characteristics and a very important aspect; it is used to confuse an opponent and is effective in helping fight several attackers. The custom of practicing Bagua Zhang is valuing strong spirit, courage, and personal loyalty. Weapons used in Bagua Zhang are mostly very distinctive being easily concealed, such as the crescent-shaped deer horn knives and scholar pens or extremely large, such as the Bagua sword and Bagua broadsword. Baji is a powerful yet simple martial art that attacks from angles the opponent cannot see. Traditional Baji is about hitting your opponent, where you are most afraid of being hit. Their stances are narrow while remaining low, a factor which allows them to pace, change their footing, and let outbursts of power. Closing in, striking, shoving, checking, bashing, jolting, charging, striking, and grappling are all fundamentals of Baji. Baji helps improve reflexes, stamina, balance, body strength, awareness of your surroundings, and much more. Tianmeng are proud to offer Baji as one of the disciplines at the academy. Xing yi is one of the three famous Nei Jia Quan (internal Kung Fu) in China. It emphasizes internal and external integration; it begins with intent and ends with form. It requires an unobstructed flow of blood and Qi and adherence to forms and principles. The body should always be in a relaxed state but still ready to spring into action, contracting the body when releasing power. Striking, power, and speed should be focused in unison to produce penetrative power. The main stances and training methods of Xing Yi are San Ti Shi (three body alignment), coordinating unity. The elbows must follow the knees, the hands the feet and the shoulders the hips. Wudang Kung Fu follows Taoist teachings which believe in the preservation of life and living harmoniously with nature. During your stay at Tianmeng, beginners will be taught the basics of Wudang. Afterward, you will learn many fist forms and when you are more experienced you can move on to weapon forms. The stances and steps are close to the floor, using the steps to trace the outline of a snake. It is focusing on using your mind clear to stay balanced and centered, and taking or redirecting the opponent's power to use against them. Tianmeng Kung Fu Academy is nestled between the footsteps of the scenic Tianmeng mountains and Tianmeng National park, located in the peaceful and friendly environment of Shandong province, China. Tianmeng Academy is unique in its authentic methods of teaching Kung Fu in China. The students have an opportunity to train in the ancient Chinese Kung Fu style “Meihua Quan” (plum blossom). It had been secretly handed down from master to disciple for thousands of years in China. Additionally, “Meihua Quan” includes training on and between special “Meihua” poles. Tianmeng Kung Fu Academy provides highly qualified Chinese Masters in traditional Kung Fu styles, such as: Shaolin Kung Fu, Sanda (Chinese Kickboxing), Wing Chun, Tai Ji, Qigong, Bagua Zhang, Xingyi Quan, Ba Ji, Qinna, Mantis, meditation, and others. The academy have at least two Masters in school that makes 6-10 students under each master usually. Over 20 students there are 3 shifu if students in school over 20 and an additional after 30 - usually in Summer time when is more busy. The masters are authentic Shaolin masters from the Shaolin Temple. They have rich experiences in teaching international students. They are dedicated to teaching their students and “opening” their individual potential. The mission of the Academy is to harmonize the Three Treasures: Essence, Energy (Chi), and Spirit in each student’s life. Tianmeng Academy believes that the journey to Kung Fu Mastery will empower each student’s wellness, life style, healthcare, and longevity. Master Wang comes from a traditional Kung Fu family. He has over than 20 years of teaching experience with students of different levels and nationalities. He is very good at Shaolin, Tai Chi, Healing Chi Gong (Qi Gong). He has got a very deep understanding of traditional Kung Fu theories and Meihua Poles training. Master Han Master Han was born in Puyang, Henan Province. He was born into a Shaolin Quan family and started to practice Shaolin Kung Fu with his father from the age of 6. At the age of 12 he went to the Shaolin Temple for further training. At the age of 17 years he followed the great Meihua Quan master Hanbai Guant to learn Kung Fu. He has a deep understanding of Meihua Quan theories and Meihua Poles training. Tianmeng Academy is located at the foot of the beautiful Tianmeng Mountains, northwest of Linyi in Shandong Province of China. The academy is surrounded by two national parks, the Tianmeng Mountain and Zhidongshi Park, where the students train regularly. 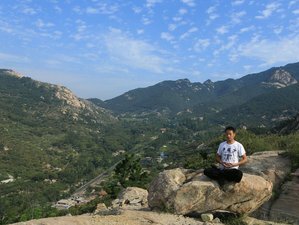 The training location provides a peaceful and pleasant environment, which is an ideal environment for aspiring traditional Kung Fu students in China. The academy offers healthy food based on traditional Chinese cuisine. This is based on rice, noodles or soup, eggs, meats and vegetables. Vegetable and meat are cooked separately. Hot meal is provided 3 times per day. Vegetarians, vegans, and muslim (request for halal food) will be catered for. Students are always welcomed to ask more food if it is not enough or buy extra food of their preference. For breakfast, the academy offer 2 eggs for each student, stir fried rice, or noodles or pancake as main food; Salad; and chinese crops soup. For lunch, the academy offer 4 dishes (3 vegetable dishes and 1 meat dishes) for each table. The academy offer 2 vegetable dishes, 1 egg dish, 1 meat dish for dinner. Apart from dishes, the academy also offer rice, bread, noodles, or dumplings during lunch and dinner. During the weekends, students are off from training. With permissions from their masters, students are allowed to go out of academy to go on a sightseeing adventure. Students can also ask for some time off, if they would like to travel on other nearby towns and attractions. Students may also go on a trip to the famous attractions during the holidays. There are four holidays a year in China: Chinese New Year, Moon festival, Academy anniversary, and Christmas day. During holidays or weekends students may go on a trip to Linyi City, Local Karst Cave (No.1 Drifting Cave of China which is 40 kilometers away from the Academy), the UNESCO World Heritage City of Qufu (100 kilometers), Mengshan National Park (20 kilometers), Mount Tai (120 kilometers), and Linyi City (80 kilometers). They have the opportunity to visit Shaolin Temple in Henan Province with their masters and be introduced to the Venerable Shi Yong Xin Abbot, or have the opportunity to be introduced to the great master of Plum Blossom fist Han Baiguang. Beijing (Peking) City: Beijing, which is the capital of China, is one of the worlds truly imposing cities that has a 3,000-year history. It is also the location of some of the famous attractions i.e. Great Wall of China, Palace Museum (Forbidden City), Tianan Men Square, Temple of Heaven, Thirteen Ming Tombs, Summer Palace, Hutong Tour, and Lama Temple. Linyi City: Linyi City is a famous city that has the third largest wholesale and retail market in China. It has a variety of commodities with cheap prices. It is also known for its modern and comfortable Linyi Airport that has many lines open connecting the city with the large and medium sized cities of China. Qufu City: Qufu is located in the southwest of Shandong province and is known for being the hometown of Confucius. It is also known for having the UNESCO world heritage sites, Confucius (Kong) Family Mansion, Temple of Confucius, and Cemetery of Confucius. Shanghai City: One of the famous cities also located next to Tashan is known for the following attractions and highlights that most students visit and try during their free time: City God Temple, Nanjing Road, Maglev Train, Jin Mao Tower, Hairy Crabs, and Rowing Boat - Water Village Tours. Tianmeng Mountain National Park: Located in Tianmeng Mountain area, this park covers an area of 3338 hectares. It has one of the most beautiful scenery in town. Tianmeng Mountain National park is known for having many species of plants, special larches and black pines imported from Japan, which has been preserved for ages. The park is also known for the variety of animals living in the park. Xian City: Xian City is known for the Terra Cotta Warriors and the Emperor Qin Shihuangs Mausoleum attractions. Zhidongshi Park: Located about 1 kilometers from the school, Zhidongshi Park is one of the famous places that students visit for fun and relaxation. A reservation requires a deposit of 13% of the total price. Tianmeng Shaolin Kungfu school teach traditional Chinese Kungfu to help you get self-defence skills, experience Chinese Culture, absorb eastern wisdom. Both tuition and application fees (100 USD) are included.